Hi there! I've got swatches of Femme Fatale today! This was my first experience with the brand. "Established in 2011 Femme Fatale is the leading Australian online boutique for handmade cosmetics & lacquer, plus additional beauty care items produced by small-scale businesses. We stock over 40 unique & vibrant artisan brands from around the world, with new products arriving each week"
I was sure looking forward to this brand! The first is a trio created for Valentine's 2015 but of course can be worn all year! 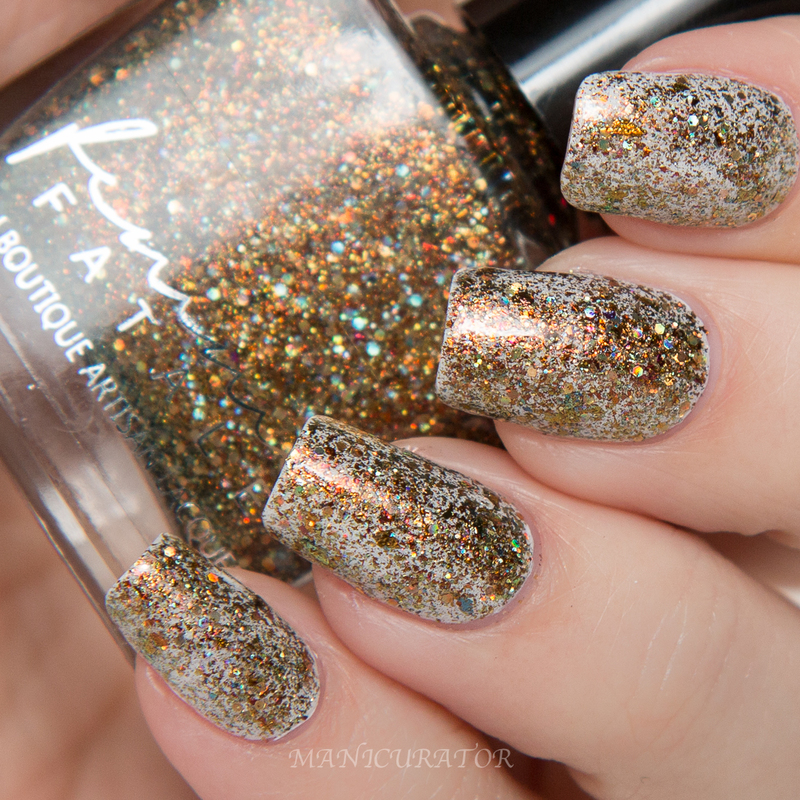 Femme Fatale Fool's Paradise - bronz-y gold shimmer and flakes with silver holo glitter. I layered one coat over KBShimmer Eyes White Open. 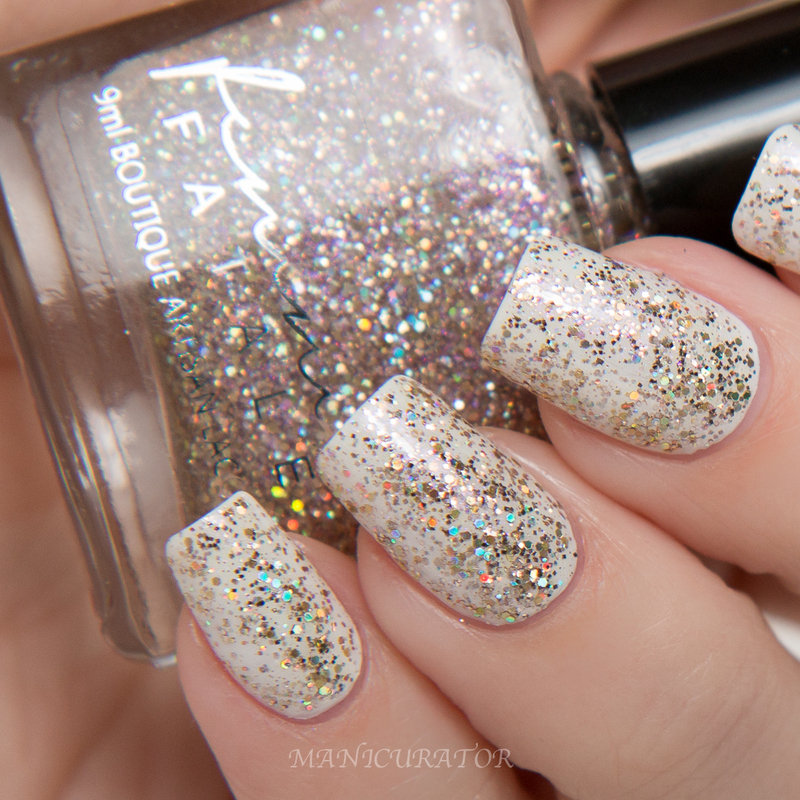 Femme Fatale Rich In Beauty - light gold and silver glitters with pink shimmer. One coat over KBShimmer Eyes White Open. I'm wishing I layered it over something else that shows off the pink shimmer better in photos. Love this one! Femme Fatale Star-Crossed Lovers - purple jelly base with shimmer and multicolored mini glitters. I used 2 coats but still had a patchy spot here and there, so 3 would be best. Formula was on the thick side. Femme Fatale All Sanity Is Lost - a teal jelly base with holo glitter and shards, pink shimmer as well. Three coats here. I'm not a big fan of shards but I do like how they look in a jelly base! 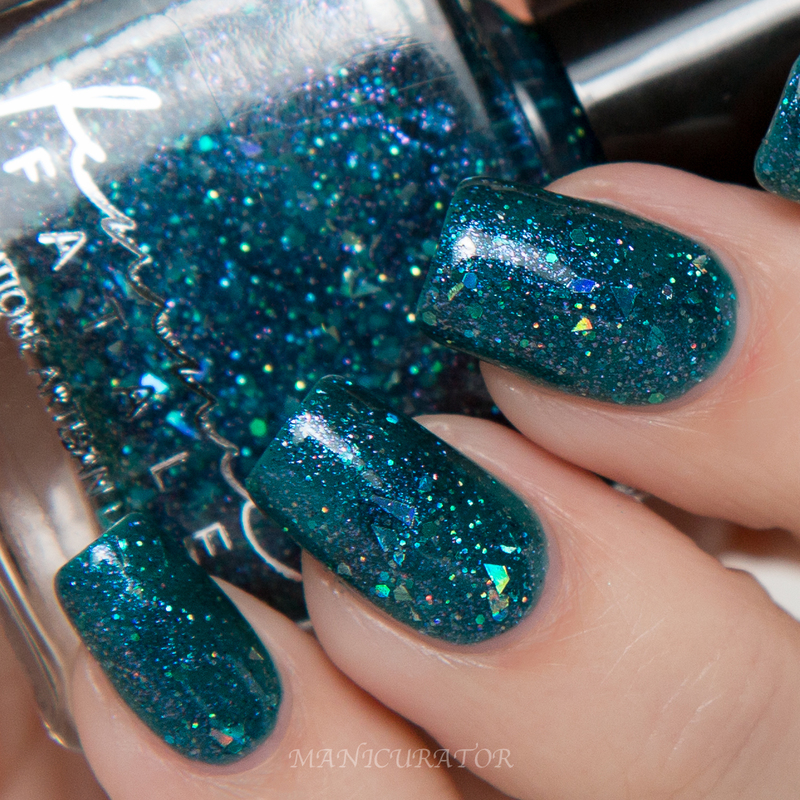 Femme Fatale Alone In The Darkness - a teal/blue jelly base with beautiful micro glitters and subtle shimmer. Three coats. 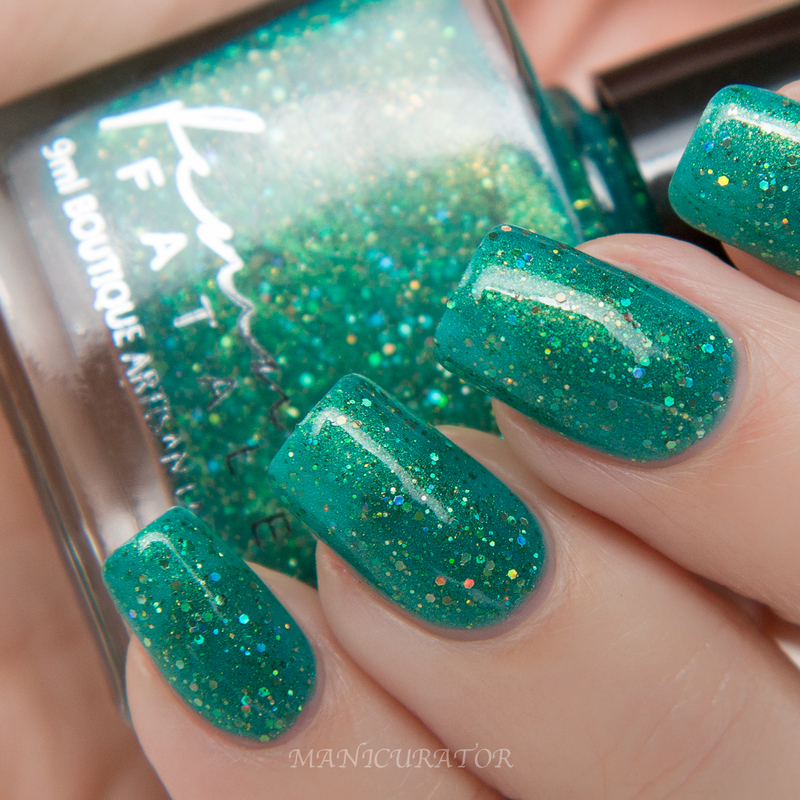 Femme Fatale Stand In The Clouds - aqua jelly base with multisized glitters with gold shimmer. Love love this one! I used 3 coats and you can see there is still slight visible nail showing through under the strong lights but not in person. Femme Fatale In His House He Waits Dreaming - scattered glitters in a brown jelly base with strong teal shimmer. I was not expecting the brown base as you can't really see it from the bottle. Definitely like it! Three coats. Femme Fatale Brain Link - scattered micro glitters in a magenta jelly base with subtle pink shimmer. Two coats was almost enough but I did three here just to be sure. 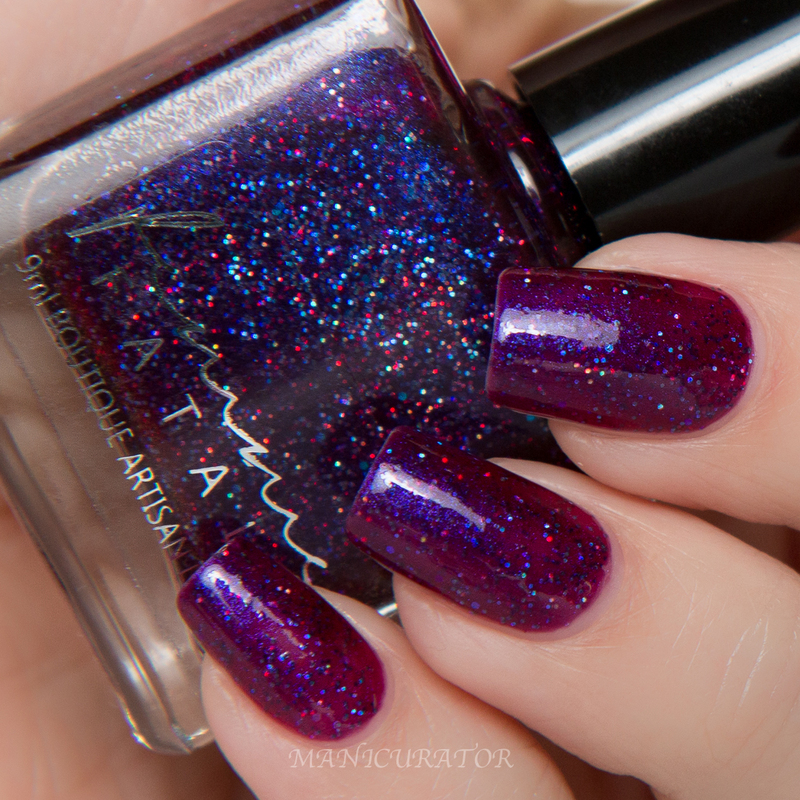 Femme Fatale Touch of Madness - scattered micro glitters in a dark purple/magenta base. Three coats here. Femme Fatale Under the Waters - purplish blue jelly base with strong turquoise shimmer. Two coats. All swatches are with KBShimmer Basic Training base coat and Clearly On Top top coat. I found that these had a slightly thick formula and benefited from top coat as they dried dull or somewhat gritty. Which ones are you liking? My fave is Stand In The Clouds! I really love Stand in the Clouds & In His House. That brown is so unique! Wow, I feel like a teenage drama queen but I honestly just can't even with these! They are all so beautiful! I kept thinking I had seen my favorite until I scrolled further and loved the next one even more. Completely obsessed In His House and Stand in the Clouds! I agree, I don't have anything else like the brown one! Wonderful swatches! There all so pretty! I NEED In His House He Waits Dreaming! I'm perfectly obsessed with all of these - especially In His House He Waits Dreaming. I love the distinct style of FF! I love so many of these! In his house he waits dreaming, Stand In the clouds and Brain link (both which color4nails does have! ), both teal colors, wow, great swatches! Neat to see a brand that is new to me. Thanks for sharing. Oh my! These are all gorgeous. I was trying to pick a favorite, but I can't.